This image has been released to the public domain and may be used freely. 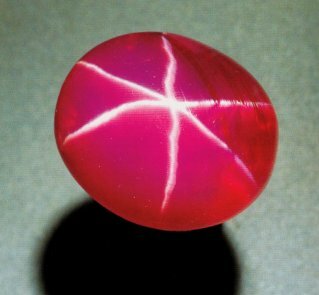 The DeLong Star Ruby, a 100.32 carats (20.06 g) oval cabochon star ruby, was discovered in Burma in the early twentieth century. It was sold by Martin Ehrmann to Edith Haggin DeLong for US $21,400, who donated it to the American Museum of Natural History in New York in 1937. The ruby was one of several precious gems stolen in an infamous jewelry heist by Jack Roland Murphy and two accomplices. After payment of a $25,000 ransom, it was recovered at the designated drop off site: a phone booth in Florida.